ANUBI-FUZZ CLASSIC now available for sale! It’s available now… first production unit ready to ship. 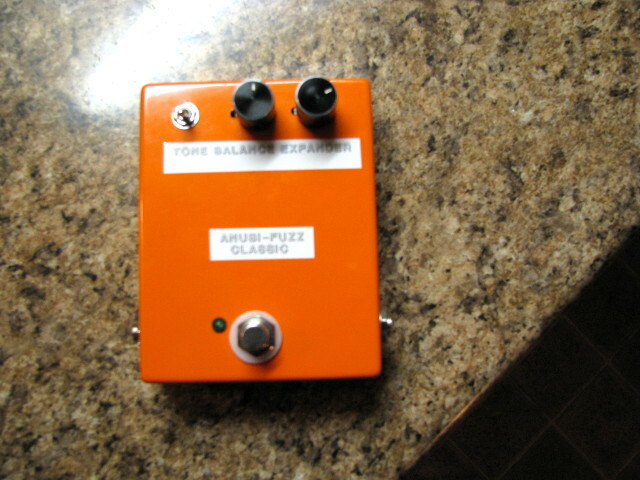 “Anubi-Fuzz Classic” clone of the Univox Super Fuzz. I’m going to initially make 12 of these, and you can order one (special intro price) for $99 + shipping. If these become popular, I will order more parts to start on a second batch. and these are still very popular due to the sound and versatility of its effects. who had been trying to talk me into making these for many years, and to whom I sent the first successful prototype. of this pedal reminded him quite a bit of a classic pedal he used during the recording of his album “Old Lions”. This unique fuzz tone is an octave fuzz using two germanium diodes to produce the square wave clipping. almost bassy tone, unique to this circuit. for the main part of the circuit, and a 2N3904 as the final (amplification) transistor. “Balance” and “Expander” are at the top right with aluminum pointer knobs. such as the Morley 9v “Universal Effect Pedal Adapter” which works with most other vintage pedals as well. The ANUBI-FUZZ CLASSIC is now available for sale!